The potential use of microorganisms as agents of biological warfare (BW) is a growing concern. Lassa virus, a member of the Arenavirus class of Hemorrhagic fever (HF) viruses has emerged as a worldwide concern among public health officials. The purpose of the present study was to further elucidate the antiviral activity spectrum of stampidine, a novel nucleoside analog with potent anti-viral activity against the immunodeficiency viruses HIV-1, HIV-2, and FIV, by examining its effects on survival of mice challenged with Lassa virus. We examined the therapeutic effect of Stampidine in CBA mice inoculated with intracerebral injections of the Josiah strain of Lassa virus. Mice were treated either with vehicle or nontoxic doses of stampidine administered intraperitoneally 24 hours prior to, 1 hour prior to, and 24 hours, 48 hours, 72 hours, and 96 hours after virus inoculation. The probability of survival following the Lassa challenge was significantly improved for stampidine treated mice (Kaplan Meier, Chi-squared = 11.7, df = 2, Log-Rank p-value = 0.003). Therefore, stampidine shows clinical potential as a new agent for treatment of viral hemorrhagic fevers caused by Lassa virus. The potential use of microorganisms as agents of biological warfare (BW) is a growing concern for several reasons, including ease of production and dispersion, delayed onset, ability to cause high rates of morbidity and mortality, difficulties in rapid diagnosis, and very limited treatment options . Biological agents that have been identified as posing the greatest threat are variola major (smallpox), Bacillus anthracis (anthrax), Yersinia pestis (plague), Clostridium botulinum toxin (botulism), Francisella tularensis (tularaemia), and hemorrhagic fever viruses . Viral hemorrhagic fevers (VHF) are virus-induced potentially fatal acute febrile, hemorrhagic diseases reported from wide areas of the world. Hemorrhagic fever (HF) viruses are enveloped, single-stranded RNA viruses that are associated with insect or rodent vectors whose interaction with humans defines the mode of disease transmission. There are 14 HF viruses, which belong to four viral families: Arenaviridae, Bunyaviridae, Filoviridae and Flaviviridae . Arenaviruses are single-stranded RNA viruses and show a predilection for rodents as virus reservoirs [3, 4]. This virus family includes lymphocytic choriomeningitis (LCM) virus, Lassa virus, and the Tacaribe complex of viruses [3, 4]. Pathogenic arenoviruses have been identified as the causative agents in Argentine HF (virus: Junin), Bolivian HF (virus: Machupo), Venezuelan HF (virus: Guanarito), Brazilian HF (virus: Sabia), lymphocytic choriomeningitis (LCM) (virus: LCM), and Lassa fever (virus: Lassa) [5–10]. The family prototype, LCM virus, was first isolated in 1933 from material of a patient who died during the first documented epidemic of St. Louis encephalitis . Lassa fever is an acute viral disease found in many countries of West Africa from Nigeria to Senegal, which causes considerable morbidity and mortality [11–14]. Lassa was initially discovered in a Nigerian hospital in the Lassa village when several nurses developed the illness . Nosocomial outbreaks have since occurred in Nigeria, Liberia, and Sierra Leone, and Lassa fever has also been encountered in United Kingdom, Germany, Japan, Canada, Israel and the United States [6, 11–21]. Severe multi-organ involvement occurs in 5–10% of infections and case-fatality rates for hospitalized patients range from 15 to 25% [22, 23]. It has also been shown to be the cause of premature births and spontaneous abortions in pregnant women. The virus is transmitted by the respiratory route and by direct contact with contaminated materials. Because of the ability of Lassa virus to spread from person to person, risk of its importation by international travel, and renewed threats about the potential use of HF viruses for BW, Lassa fever has emerged as a worldwide concern among public health officials . The high incidence and severity of pediatric Lassa fever is of particular concern: A systematic study of Lassa fever in febrile children was undertaken over a four-year period, from August 1977 to August 1981, in the Eastern Province of Sierra Leone, West Africa. 479 patients were studied. Of these, 245 had adequate specimens to confirm or exclude the laboratory diagnosis of Lassa fever. 51 cases of Lassa fever were identified (21% of patients for whom diagnosis was possible) . Thirty-three cases of pediatric Lassa fever were identified at Curran Lutheran Hospital and Phebe Hospital in Liberia between January 1980 and March 1984. All 18 fetal cases died and the case-fatality rate for 15 childhood cases was 27% . Stampidine (STAMP), stavudine-5'-[p-bromophenyl methoxyalaninyl phosphate], is a novel nucleoside analog with potent anti-viral activity against the immunodeficiency viruses HIV-1, HIV-2, and FIV, which may provide the basis for effective salvage therapies for patients harboring highly drug resistant strains of HIV-1 . Stampidine exhibits potent in vitro antiretroviral activity against primary clinical HIV-1 isolates with genotypic and phenotypic NRTI-resistance, clinical HIV-1 isolates of non-B envelope subtype originating from South America, Asia, and sub-Saharan Africa, as well as NNRTI-resistant HIV with nanomolar IC50 values . We previously investigated the in vivo pharmacokinetics, metabolism, toxicity, and antiretroviral activity of STAMP in rodent species [29, 30]. In mice and rats, STAMP was very well tolerated without any detectable acute or subacute toxicity at single intrapertitoneal or oral bolus dose levels as high as 500 mg/kg . Notably, daily administration of STAMP intraperitoneally or orally for up to 8 consecutive weeks was not associated with any detectable toxicity in mice or rats at cumulative dose levels as high as 6.4 g/kg . STAMP exhibited potent in vivo anti-HIV activity in Hu-PBL-SCID mice at nontoxic dose levels . In accordance with its safety profile in rodent species, a four-week stampidine treatment course with twice daily administration of hard gelatin capsules containing 25 mg/kg – 100 mg/kg stampidine was very well tolerated by dogs and cats at cumulative dose levels as high as 8.4 g/kg . A 4-week treatment course with STAMP administered in gelatin capsules twice daily showed a dose-dependent antiretroviral effect in chronically feline immunodeficiency virus (FIV)-infected cats, as evidenced by a ≥1-log decrease of the FIV load of circulating peripheral blood mononuclear cells within 2 weeks after initiation of STAMP therapy . The antiviral activity of stampidine is not limited to HIV and FIV. Stampidine was also found to inhibit adenovirus-induced plaque formation in skin fibroblasts at nanomolar concentrations . The purpose of the present study was to further elucidate the antiviral activity spectrum of stampidine by examining its effects on survival of mice challenged with Lassa virus. The synthetic procedures for preparation of Stampidine [2',3'-didehydro-3'-deoxythymidine 5'-(p-bromophenyl methoxyalaninyl phosphate)] (STAMP) have been previously described in detail [34, 35]. CBA strain mice were intracerebrally infected with 1000 PFU of Lassa virus (Josiah strain) that resulted in lethality of 80–100% of control (non-treated) animals in 7–9 days after infection. Control animals were given physiologic salt solution as a placebo instead of the compound. In general, for non-treated animals, clinical signs of the disease manifested on the 5th and 7th days by presenting: weight loss, immobility, disheveled hair, convulsions, severe decubitus paralysis and death. All subjective measurement of decreased mobility and scruffy fur were done in a blinded fashion as not to influence the results. The protective properties of the experimental antiviral drugs were assessed by using the following treatment-preventative regimen: Mice were treated either with vehicle or stampidine (25 mg/kg or 50 mg/kg) administered intraperitoneally 24 hours prior to, 1 hour prior to, and 24 hours, 48 hours, 72 hours, and 96 hours after virus inoculation. Mice were then observed for 21-days post infection. The protective effect of the experimental anti-viral drugs was evaluated according to the rise of the survival rate and prolongation of mean life of the experimental animals as compared with the control animals. In order to evaluate the anti-Lassa activity of stampidine, CBA mice were inoculated with intracerebral injections of the Josiah strain of Lassa  at a 1000 PFU dose level, which is lethal to 70–100% of mice within 7–12 days . Mice were treated either with vehicle or stampidine administered intraperitoneally 24 hours prior to, 1 hour prior to, and 24 hours, 48 hours, 72 hours, and 96 hours (Total number of doses administered to each mouse = 6) after virus inoculation. Mice were then observed twice daily for 21 days for morbidity and mortality. Of the 20 control mice, 2 died on day 1 immediately after intracerebral injection due to accidental brain injury and are not available. All of the remaining 18 vehicle-treated control mice developed decreased mobility and scruffy fur as the clinical signs of Lassa infection between days 6 and 10 (Table 1). Fourteen of the 18 control mice developed seizures between days 7 and 11. Thirteen mice experienced 4–10% weight loss and died between days 8 and 11 (Table 1, Figure 1). Of the 10 mice treated with stampidine at the 25 mg/kg dose level, two died accidentally immediately after intracerebral Lassa virus inoculation. All of the remaining 8 mice developed decreased mobility and scruffy fur as the clinical signs of Lassa infection between days 6 and 10. Two of these mice experienced 4–8% weight loss, developed seizures and died on days 8 and 10, respectively. The remaining 6 mice survived the Lassa challenge beyond the 21-day observation period and did not experience any weight loss or seizures (Table 1, Figure 1). 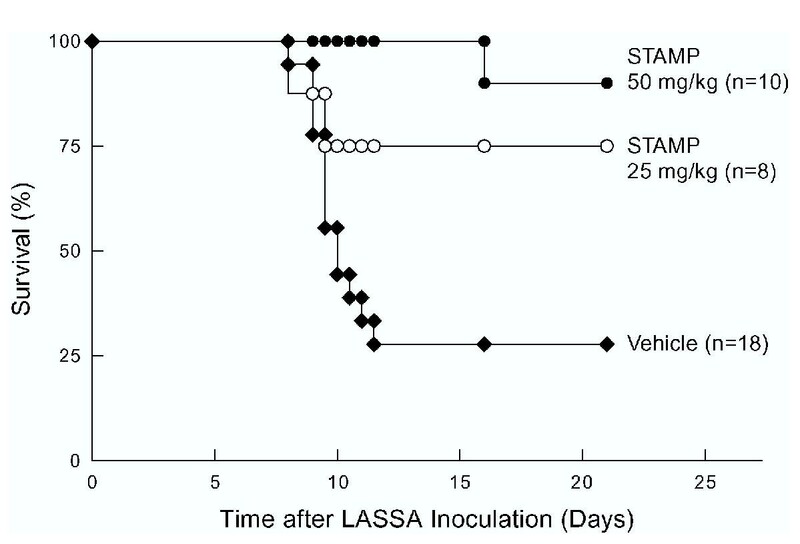 Of the 10 mice treated with stampidine at the 50 mg/kg dose level, only one mouse developed delayed signs of Lassa infection on day 13 as evidenced by decreased mobility and scruffy fur, lost weight, and died on day 16 after intracerebral Lassa virus inoculation. All 9 of the remaining mice remained healthy without clinical signs of Lassa infection beyond the 21-day observation period. The probability of survival following the Lassa challenge was significantly improved for stampidine treated mice (Kaplan Meier, Chi-squared = 11.7, df = 2, Log-Rank p-value = 0.003): The probability of survival at 21 days was 28% (7–48%, 95% confidence limits) for vehicle-treated mice (median survival = 9 days), 75% (45–100%) for mice treated with stampidine at the 25 mg/kg dose level (median survival >21 days), and 90% (72–100%) for mice treated with stampidine at the 50 mg/kg dose level (median survival >21 days). Protective Activity of Stampidine in CBA Mice Challenged with Lassa Virus. CBA mice were inoculated with intracerebral injections of the Josiah strain of Lassa at a 1000 PFU dose level. Mice were treated either with vehicle or stampidine (25 mg/kg or 50 mg/kg) administered intraperitoneally 24 hours prior to, 1 hour prior to, and 24 hours, 48 hours, 72 hours, and 96 hours after virus inoculation. Mice were then observed twice daily for 21 days for morbidity and mortality. Results are presented as the cumulative proportion of mice surviving after virus inoculation. See Table 1 for more detailed information of the treatment outcome. These results provide unprecedented evidence that stampidine is active against Lassa fever virus and exhibits a potent prophylactic effect when used at nontoxic dose levels. Therefore, stampidine shows clinical potential as a new agent for treatment of viral hemorrhagic fevers caused by Lassa virus. In view of the growing concerns about the possible use of HF viruses as BW agents, it will be important to determine if stampidine has activity against other viruses associated with lethal viral hemorrhagic fevers and/or encephelomyelitis, such as the Ebola viruses of the Filoviridae family. The previously documented in vitro and in vivo antiretroviral activity of stampidine against primary clinical HIV-1 isolates with genotypic and/or phenotypic NRTI-resistance together with its favorable animal toxicity profile, pharmacokinetics, and in vivo antiretroviral activity in FIV-infected cats have prompted the further development of this promising new NRTI compound as an anti-HIV agent. Our results presented herein provide unprecedented experimental evidence that stampidine exhibits antiviral activity in the central nervous system (CNS) of Lassa virus-infected mice. The ability of zidovudine prodrugs, such as stampidine, to cross the blood-brain barrier have been previously described . Our previous experiments have demonstrated that stampidine is rapidly metabolized to its active form, ala-MP in plasma (> 95% within 5 mins). Thus, binding of stampidine to plasma proteins is not a phenomenon that would interfere with efficacy. These observations are relevant because HIV-1 also infects the CNS and it has been feared that the CNS may be a sanctuary site where HIV-1 could hide and continue to replicate despite otherwise effective antiretroviral treatment [39, 40]. A variety of HIV-induced lesions of the CNS have been described, including HIV encephalitis, HIV leukoencephalopathy, axonal damage, and diffuse poliodystrophy with neuronal loss of variable severity . HIV-1 encephalitis and its associated dementia can occur in up to 20% of infected individuals, usually when productive viral replication in brain mononuclear phagocytes (macrophages and microglia) and depletion of CD4(+) T lymphocytes are most significant [42, 43]. Hence, antiretroviral treatment of HIV-infected persons should include agents with potent activity in the CNS . Our results support the notion that stampidine may be useful for inhibition of HIV replication in the CNS. Lassa fever has emerged as a worldwide concern among public health officials because of the ability of Lassa virus to spread from person to person, risk of its importation by international travel, and renewed threats about the potential use of HF viruses for biological warfare. Given the need for an anti-viral agent to treat patients with Lassa fever, we examined the therapeutic potential of Stampidine, a novel nucleoside analog with potent anti-viral activity against the immunodeficiency viruses HIV-1, HIV-2, and FIV, in Lassa-infected mice. Treatment with stampidine significantly improved the probability of survival following the Lassa challenge. Therefore, stampidine shows clinical potential as a new agent for treatment of viral hemorrhagic fevers caused by Lassa virus. In this first study, mice were treated with 6 doses of stampidine and 2 of the treatments were administered prior to virus inoculation. The elucidation of optimized prophylactic as well as post-exposure treatment regimens will be the focus of our future studies. A. P. & L. T. designed and conducted the Lassa experiments. F.M.U. & A.V. provided STAMP and designed the Lassa experiments with A.P. and L.T. F.M.U and H.T. wrote the manuscript. All authors read and approved manuscript. An erratum to this article is available at http://dx.doi.org/10.1186/1471-2334-4-14.